The Cultural Landscape of Southern Jerusalem, Battir is a series of agricultural valleys with stone terraces. The villagers of Battir use a traditional method of agriculture, focused on olives, vines and fruit. Their ancestors built an unique irrigation system that utilizes man-made terraces with dry-stone walls. Battir's eight main clans take turns each day to water the village's crops. The town of Battir lies in the West Bank, south of Jerusalem. 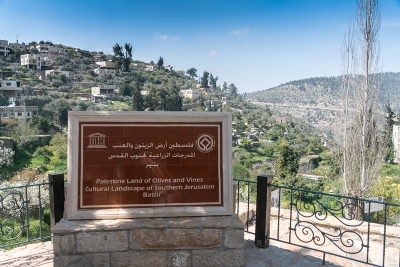 This is the first part of a serial nomination named "Palestine: Land of Olives and Vines". The village of Battir is not far from Jerusalem and is right on the Israel/Palestine border. In fact, there are Israeli train tracks which go right past the terraces at the bottom of the hill. I could not find any organized tours to Battir, which was a shame. Nearby Bethlehem gets most of the attention in the region. That being said, it wasn’t that hard to get to Battir from Bethlehem. I had my tour guide in Bethlehem call a taxi for me which took me to there. It took about 15 minutes and cost about $10. Battir is a fairly new world heritage site and as such the tourism infrastructure isn’t well developed. There are a few souvenir shops and cafes, but that’s about it. The terraces are easily accessible if you are on the main street of the village. Expect to spend 30-60 minutes walking around the area. This site is probably going to be of interest to world heritage enthusiasts more than anyone else. Nonetheless, I think anyone visiting Jerusalem would be well off to come and visit a small Palestinian village, which Battir fits perfectly. Battir is a small village in Palestine, easily available with a short drive from Bethlehem. Battir is known from its stone terraces, which were (and currently are) used for planting olive, vine, vegetables and fruits. When I told the taxi driver that I wanted to visit Battir he said that for him the popularity of this place among foreign tourists seemed strange, as for Palestinians this is just an ordinary village. I suspect the main reason tourists want to visit Battir is its World Heritage status, because indeed the place is not an attractive spot. This type of stone terraces is very popular in Mediterranean region and nobody claims that those other places have an outstanding universal value. Nonetheless, visiting Battir was not a complete waste of time, as we could see that very traditional farming methods are still practiced nowadays. The landscape of Battir area is also quite nice. Still, I would not recommend Battir for tourists that are not strong WHS fans as this was for me the least attractive WHS one in Israel/Palestine. I visited this newly inscribed WHS in April 2009. The terraced landscape full of olive trees is the main highlight I remember appreciating from this site, although I would never have imagined that this site would become a WHS. In my opinion it has no OUV and it isn't different or better than many Mediterranean rural areas or countryside with the same landscape or irrigation methods. My visit to Battir took place in June 2013. At that time, the boundaries of site were unclear. (now available at http://www.bic.com.ps/bcc/images/BaNF%20Final.pdf). So I went around a bit by chance. I took bus 21 from Jerusalem to Bethlehem (Bet Jala). A first glimpse at the site happens right after the two tunnels under Bet Jala. There, on the right of the road, lies the main core zone, with a very nice valley bordered with terraces and olive trees. A better glimpse appears as the bus turns back toward Bethlehem. After leaving the bus, I hired a taxi to get to Battir. It is a 10 minutes drive. There is a also a bus from Bethlehem, leaving from Cinema Plaza, to the village of Battir. At the center of Battir village lies the the Ain Al-Balad source. It was a very warm day, and children and teenagers were playing in the water. It is part of the core area, the village itself being in the buffer zone. Below the source lies the ancient roman pool. From there, several hiking path lead to the westren part of the core area (I lacked time to hike there). After the village, the road continues into the eastern valley, with plenty of very nice views on the agricultural terraces made of dry stones and the olive trees. Battir is an pleasant and easy side trip from Bethlehem. You can spend an hour (like I did) but also hike around for a full day. 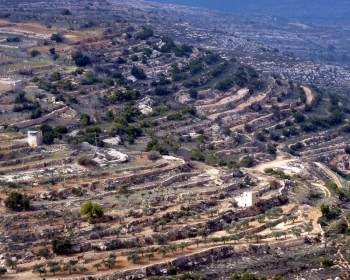 Built in the 2nd Millennium BC: The village of Battir, which developed on the outskirts of this cultural landscape, and was inhabited by farmers who worked and still work the land, attests to the sustainability of this system and to its continuation for the past 4,000 years (Nom File). 50 Community Members have visited.